Who has a problem? I do. I’m addicted to dolly pattern books. And I will go through crazy lengths to get them. And if I had more time, I’d actually make stuff from them. 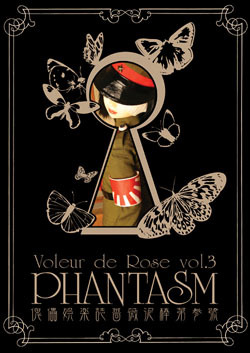 And I just found out they’ve released Voleur de Rose vol. 3 “Phantasm”… die. swoon. That makes three editions so far in a year? Awesome. Does anyone know of a better way to get a hold of these other than trolling YJP? Also, Little Princess has a new site (I think it is new) and says one of her favorite bands is “Daisy Chainsaw.” Yay. P.S. I’m still looking for the DDK MSD Alice Pattern book from 2004 “Couturerie Recipe” if anyone knows where to find one…! Rather late to this ball, but I’ll answer nonetheless. I recently bought Vol.1 & 3 for very reasonable prices from JPQueen (.com) They also have a fearsome collection of Kouga Yun doujinshi, some of which is… scandalous.